Violet Mersereau (October 2, 1892 – November 12, 1975) was an American stage and film actress. 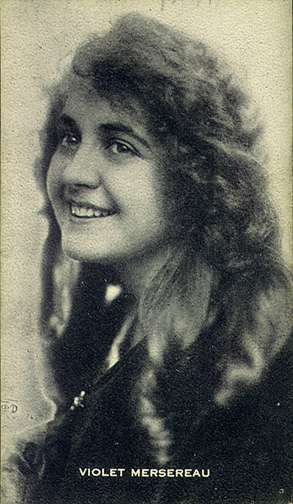 Over the course of her screen career, Mersereau appeared in over 100 short and silent film features. Mersereau was born in New York City and had a younger sister, Claire (1894-1982). Mersereau's father died when she was 9-years old. Mersereau's maternal grandmother, Mme. Luzanzie, had been a noted stage actress in France. While Mersereau's own mother had acting aspirations, she never pursued a career in acting but decided to allow her children to begin acting. At the age of 8, Mersereau played child parts in repertory theatre. She toured with Margaret Anglin and portrayed the role of "Flora" in the original company of The Clansman. The play continued to show for three years. During her time as a stage actress, Mersereau was given the nickname "The Child Wonder". She also starred on the touring production of Rebecca of Sunnybrook Farm and then became a screen actress. In 1908, Mersereau made her first film for the Biograph Company. She stayed with the company until 1911. Mersereau then signed with Independent Moving Pictures where she appeared in ingenue roles. She found success with these roles and was often cast as innocent young helpless girls which was a popular staple in films at the time. When Independent Moving Pictures and several other studios merged to form Universal Pictures, Mersereau continued working for Universal. During this time, Mersereau appeared in several short films alongside William Garwood (who often directed the films). In 1916, Carl Laemmle decided to open one of his eastern United States studios for Mersereau's own productions. Laemmle engaged Oscar A. C. Lund to direct her in these features. Mersereau had always exhibited a distinct preference for working in the East, and disliked California. Among her most successful ventures for Blue Bird and Universal include The Boy Girl (1917), Morgan's Raiders (1918), Little Miss Nobody (1917), Susan's Gentleman (1917), The Honor of Mary Blake (1916), Souls United (1917), Autumn (1916), and The Little Terror (1917). The most acclaimed project of Mersereau's final period was Nero (1922), directed by J. Gordon Edwards, grandfather of Blake Edwards. she continued in motion pictures into the 1920s with her final film being The Wives of the Prophet (1926), in which she had the role of Alma. Mersereau died on November 12, 1975 in Plymouth, Massachusetts, at the age of 83. This is a partial list of filmography. ^ a b Vazzana, Eugene Michael (2001). Silent Film Necrology (2 ed.). McFarland & Company Incorporated Pub. p. 364. ISBN 0-786-41059-0. ^ Doyle, Billy H.; Slide, Anthony (1995). The Ultimate Directory Of the Silent Screen Performers: A Necrology Of Births and Deaths and Essays On 50 Lost Players. Scarecrow Press. p. 53. ISBN 0-810-82958-4. ^ Waterbury, Ruth (1917). Photoplay: The Aristocrat of Motion Picture Magazines, Volumes 13-14. Photoplay Magazine Publishing Company. p. 114. ^ Lowe, Denise (2005). An Encyclopedic Dictionary of Women in Early American Films: 1895-1930. Psychology Press. p. 370. ISBN 0-789-01843-8. Iowa City, Iowa Citizen, Violet Mersereau, Tuesday, October 1, 1918. Page 5. Lincoln, Nebraska Sunday Star, Answers To Movie Fans, March 18, 1917, Page 3. Lincoln Sunday Star, Answers To Movie Fans, March 25, 1923, Page 15. Wikimedia Commons has media related to Violet Mersereau.